Acknowledged author wrote COMMUNICATION MATTERS (LOOSE-LEAF) 3 comprising 496 pages back in 2017. Textbook and etextbook are published under ISBN 1259707768 and 9781259707766. 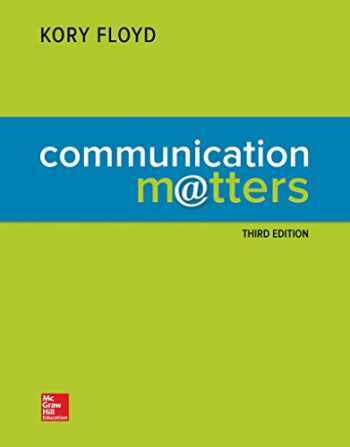 Since then COMMUNICATION MATTERS (LOOSE-LEAF) 3 textbook received total rating of 3.5 stars and was available to sell back to BooksRun online for the top buyback price of $48.09 or rent at the marketplace. Communication Matters: Effective communicators aremade, not born.We all communicate, all the time. Consequently, manyof us believe we're experts, that good communication is based on personalinstincts. In this highly interactive program, students learn to thinkthrough how they communicate rather than rely solely on their instincts. They develop the skills needed to become effective communicators. CommunicationMatters prompts students to question their assumptions, challenges themto think critically about why and how they communicate in the ways that theydo, and provides solid tools and takeaways that students can employ tocommunicate effectively even in difficult situations. Through an adaptivereading experience with SmartBook, student videos for public speaking, anddynamic online activities, Communication Matters urges studentsto consider which choices are likely to be effective and which less so.